X-ray inspection has led the field in providing expanded inspection capabilities for years. 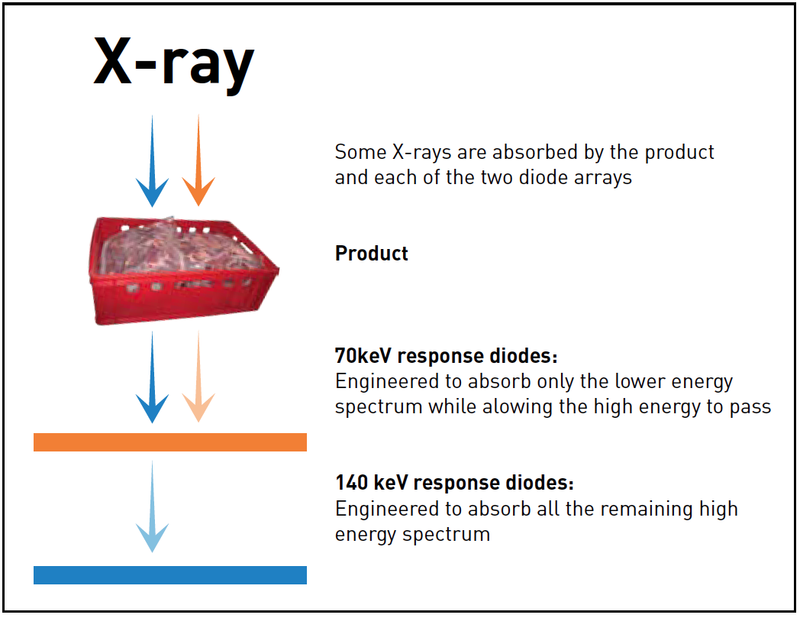 Now EAGLE Product Inspection introduces its latest x-ray innovation, MDX Technology. MDX Technology enhances traditional x-ray inspection to allow detection of materials previously unseen by x-ray or any other conventional means. This ability is especially valuable in difficult or "busy" images which contain high variations in image density. The following image is a bag of frozen potatoes containing pieces of two rubber grommets. The picture on the left is a traditional x-ray image. As you can see, the varying density of the product image makes it impossible to isolate the contaminants based on traditional x-ray methods. The image to the right uses MDX Technology to easily distinguish the rubber grommets from the product.